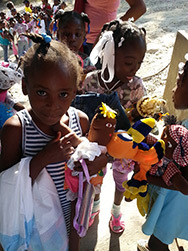 This year a lot of energy went into making dolls for the children at the orphanage run by the Little Sisters of the Incarnation in Haiti. 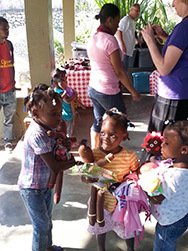 For many months over the summer, lots of women came to the Carmelite Community of the Word’s Incarnation Center to sew, stuff, and decorate dolls for the children. As the summer drew to a close, someone decided that we should make dolls for the Little Sisters as well! Finally, someone came up with the idea that dolls would be made for all of the doll makers! 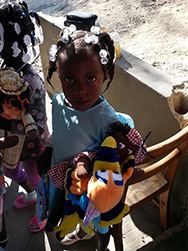 It was great fun and all came to fruition with the trip to Haiti and the distribution of the dolls to children at the orphanage as well as the Little Sisters.